Manage accounts. 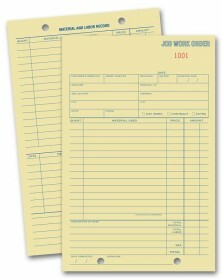 High quality job work order forms record costs and make invoices easy. Get the details. Extra-large work description area, including 13 lines for detailed write-ups. Get the details. Includes 13 lines to summarize the work or services rendered. Durable. Last part is sturdy manila tag. Horizontal format documents big projects completely with extra-large columns for material costs & work descriptions. Manage accounts: 31 lines for material costs, plus 16 lines for work and labor descriptions. 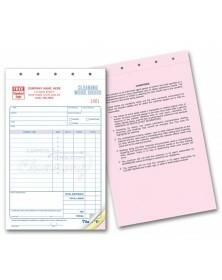 Perforated invoice detaches from materials list. Get the details: Horizontal format documents big projects completely with extra-large columns for material costs and work descriptions. Track customer acceptance: Signature line for customer authorization prevents disputes. Create clean records: Carbonless forms stay tightly aligned for clear, clean copies. 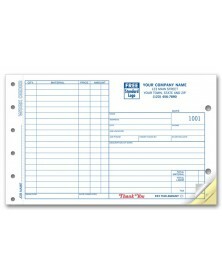 Durable: Last part is sturdy manila tag; useful for tracking jobs & calculating profit. Personalize for free: Includes your business imprint plus choice of typeface & standard business logo. Get noticed: Additional customization options include imprinting your custom logo. 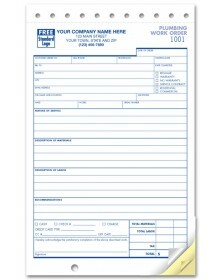 This service order business form keeps you organized and provides customers with a detailed service record. Prevent customer disputes. Our work orders come with a signature line for customer authorization to help prevent disputes. Handy format. This work order comes in a snapset format. Carbonless work orders. 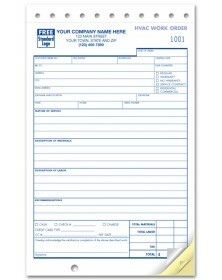 These business forms are available in carbonless 2 or 3 part forms. Convenient numbering system. Consecutive numbering is available for these work orders. Free personalization! Our work orders include your business imprint plus choice of typeface & standard business logo for free. 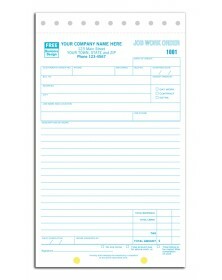 This work order form keeps you organized and provides customers with a detailed service record. Add a custom logo! Additional customization options include imprinting your custom logo. Extra-large work description area, including 13 lines for detailed write-ups. Carbonless 2 or 3-part forms. 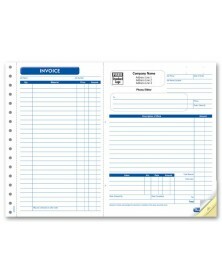 Last part is durable tag stock, useful for tracking jobs & calculating profit. Carbon-backed sets available in 2 or 3 parts. 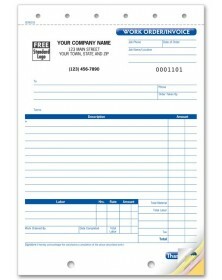 A work order & invoice in 1 side-stub carbonless form! 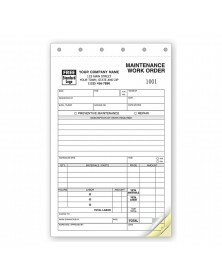 Preprinted areas for material costs, descriptions, labor, signature & dates. 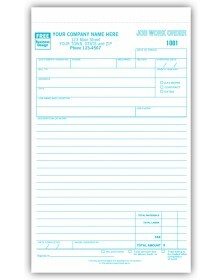 Last part is durable tag stock preprinted with a material & labor record for future reference. Get the details. Room to list project details and itemize charges. Lined on both sides. Stay organized. 50 sheets per pad; pre-numbered. Please note: Quantities are number of forms; not pads. Never guess if a task needs to be completed. Instead, confidently approach it with a detailed and accurate list of requests. Our work orders assist with this aspect of business, no matter if you operate an office or auto body shop. 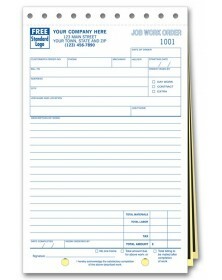 Carbonless paper produces multiple copies with less time and effort, and several blank lines provide a perfect canvas for listing all services requested. As work orders can serve as an invoice or contract, our forms are additionally equipped with signature lines and totals fields, in case the need arises.